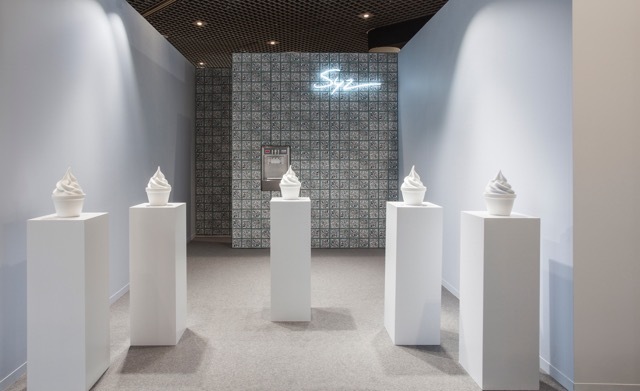 The collaboration consists of five one-of-a-kind jewelry pieces by Syz, each contained within a Frozen Yogurt jewelry box sculpture by Israel, made of painted ceramic and hand blown glass in an edition of 5. SUZANNE SYZ first began designing jewelry 15 years ago. She has always been inspired by the art and artists of her time (www.thesyzcollection.com). Syz’s work is exclusively produced in Geneva by the world’s best craftsmen, and every piece she makes is unique. Expanding upon ideas of jewel display and presentation—while bringing new life to a conservative form—Syz has invited contemporary artists to re-envision the jewelry box as a sculptural proposition. Beginning with John Armleder in 2016, Syz is proud to announce her second project in this ongoing series with the American artist Alex Israel. ALEX ISRAEL was born in Los Angeles in 1982. Deeply entwined with his hometown, his work explores popular media, Hollywood, and the cult of celebrity, while positing LA as central to an understanding of American culture and the American dream. His work has been the subject of solo exhibitions at: Le Consortium, Dijon; The Nasher Sculpture Center, Dallas; The Huntington Library, Art Collections and Botanical Gardens, San Marino, California; and the Astrup Fearnley Museum in Oslo. His work is included in numerous museum collections worldwide including: MoMA, New York; The Whitney Museum of American Art, New York; Solomon R. Guggenheim Museum, New York; MOCA, Los Angeles; Centre Pompidou, Paris; Moderna Museet, Stockholm; Museum Boijmans van Beuningen, Rotterdam; The Israel Museum, Jerusalem; The Hirschhorn, Washington D.C., and the Los Angeles County Museum of Art. Suzanne Syz, from the very beginning, has been a great supporter of my work. We share a love of all things pop, and also a love of sugar and sweets. Frozen yogurt has been an important part of my life since childhood, when my father opened a neighborhood frozen yogurt shop in LA. From my conversations with Suzanne, it became clear that a jewelry box is not only a place to store jewels, but also a vessel for the storage of great memories. 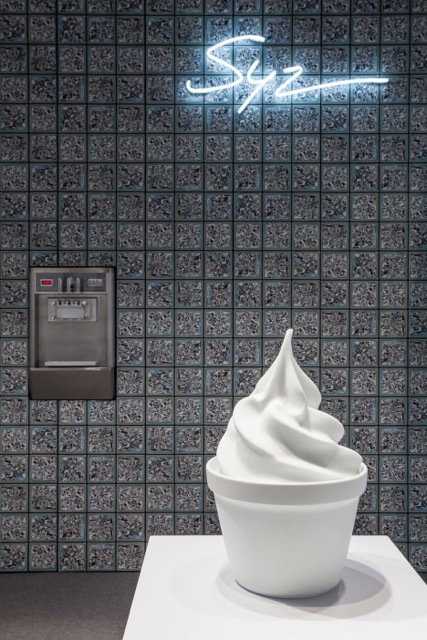 The collaboration was inspired by The Bigg Chill, my marble and styrofoam sculpture of frozen yogurt named after my father’s shop, and my memories of hanging out there almost every day after school.